Aloo Bajji/ Potato Fritters is a simple deep fried snack for munching along with a cup of hot tea especially in the monsoon season. This is my son's favorite snack. Whenever I prepare Mirchi Bajji, I have to make sure to make some aloo bajji's for my little one. This is our all time favorite snack. Give it any time of the day and we are happy to munch some. Its a quick and easy recipe, so by chance you have some guests drop in suddenly, onion and potato bajji's surely will come to your rescue. Tried adding some masala's to this as I usually do it with besan, chilli powder, salt and ofcourse Potatoes. Fresh coriander leaves - 2tbsp chopped. 1. Peel and wash the potatoes and slice it. 2. Prepare the besan batter by adding sufficient water to get a thick free flowing consistency with all the ingredients mentioned above except oil and potato. 3. Dip each potato slices in the batter and drop it in a hot oil for deep frying. Fry these on both sides till you get a light golden brown crisp potato fritters. 4. 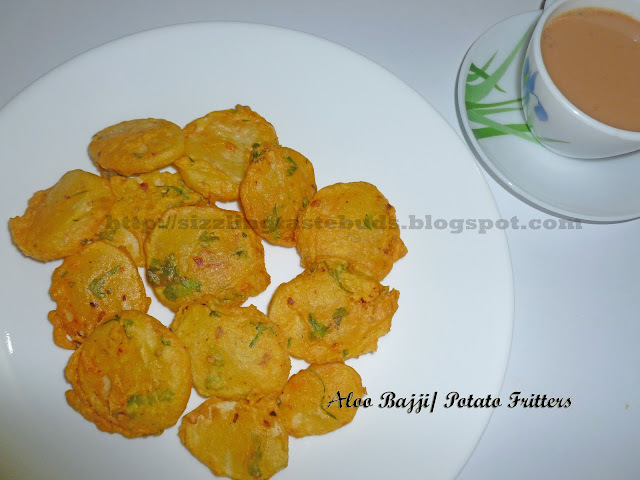 Remove the fried potato bajji from oil and place it on a kitchen tissue to absorb excess oil. 5. Serve it with Tomato ketcup or spicy Pudina Chutney along with hot Tea/ Coffee. Hey, I like reading your blog and especially the egg dishes and have passed along the ‘One Lovely Blog Award’ to you. Congratulations! Thank u so much for your appreciation and the award.